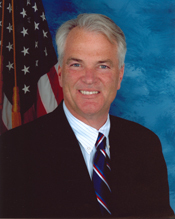 Mike McMahon (born September 12, 1957 in New York, New York) currently serves as the Democratic U.S. Representative from New York's 13th congressional district, covering Staten Island and neighborhoods of Brooklyn. He currently serves on the House Foreign Affairs Committee and Transportation and Infrastructure Committee. McMahon graduated from New York University and earned a law degree from New York Law School. He was elected to the New York City Council in 2001 and to the House of Representatives in 2008 after incumbent Republican Vito Fossella retired after a drunk driving arrest in Virginia and allegations of an extramarital affair. He was handedly elected with 61% of the vote, despite Republican John McCain edging out Obama in the conservative-leaning 13th district 51%-49% in the 2008 Presidential Election. In November 2009, McMahon was one of 38 House Democrats who voted against the Affordable Health Care for America Act, the only member of New York City's congressional delegation to do so. McMahon caused controversy in July 2010 when his reelection campaign distributed a list titled "Grimm Jewish Money Q2", against his Republican opponent Michael Grimm. McMahon's communications director Jennifer Nelson was quoted saying "Where is Grimm's money coming from? There is a lot of Jewish money, a lot of money from people in Florida and Manhattan, retirees." Nelson was fired from the campaign.